If you are looking for some fresh ideas of ways to spruce up your backyard, then look no further. 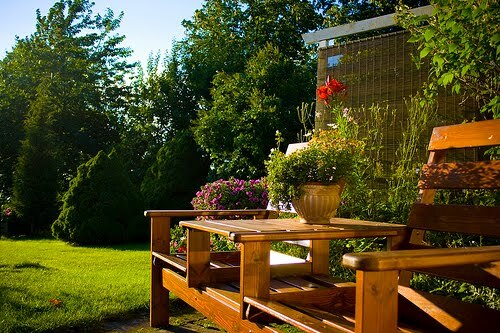 We’ve provided some ideas that prove that a little money can go a long way when it comes to making your backyard look nice. We’ve also provided some ideas for the ambitious ones, which require more work and more cash. However, the results will certainly pay off in the long run, and on your home value. One of the easiest ways to make your backyard look better right from the get-go is to have neatly organized flower pots with flowers. These can be purchased at yard sales for a fraction of the price than at a gardening store. You can either have them filled with flowers already or purchase some flowers at a nearby craft store. Make sure that the flowers are purchased on sale. These flower pots can then be placed in various locations in your yard to make it look better. The nice thing about flower pots, is that you can move them indoors during the colder weather months and then use them over and over again. This has very little expense and takes very little time to do. Another way to spruce up your backyard without burning through cash is to put bamboo torch lights around the yard. These can range in price, usually starting at around $50 for a set of three. They also may take some time to put into the ground. Usually more than one person needs to do this, as it may take a while to get it properly placed in the ground so they will not fall over. Most importanlty, do not construct a torch on your own. If you are unsure about the environmental effects of the torches, as an environmental professional. If you have a large number you want to put in place, it might be a good idea to have an environmental site assessment to be sure you are not breaking any laws if you live within city boundaries. If you are more ambitious and are looking for a large backyard renovation, then a trellis garden is a great option for you. Because setting one up is a larger undertaking, planning and designing the trellis garden of your dreams must be in order to meet the dimensions and current look of your backyard. Design it so that it gives a great visual effect. A trellis can cost from $40 on up. By shopping at a generic department store, you can usual get the best prices available. Also don’t be afraid to explore any online options. If you have a seat around the trellis, it is also nice to decorate that up. Those sort of supplies can be bought at most craft stores. If you have any large stones lying around your backyard, simply dig them up, wash the dirt off, and then arrange them around the sitting area. Be sure to dig a hole for each of the stones so it has a more natural look. If the structure is a bit wobbly, it may be an idea to support it with something sturdy like a steel bar so it can withstand tough weather. Best of luck on whatever backyard renovations you have in store. Most importantly, have some fun with your project, and enjoy the nice weather that is soon to come! This article was contributed by Pro-Tec Equipment, a distributor of trench shoring products.